IMPORTANT: Please fill out engraving information before check out. 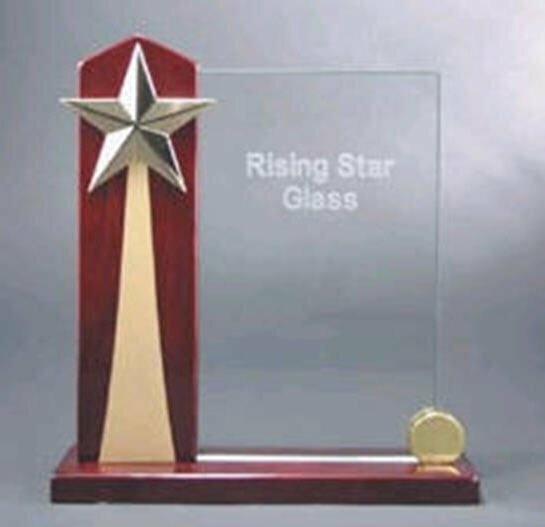 (Engraving options will appear on product options) This elegant glass with a star stylish look can be a great idea for a company award. Its beautiful eye catching rosewood base makes it a desired award for you to design any custom creation. Check out our engraving options for logo placement and engraving details. Artwork can be submitted to artwork@buyawardsandtrophies.com. Acceptable files are (.cdr or .ai or .eps) Charges may apply if art needs to be re-drawn. Proofs will be e-mailed.